Parents Push For Diversity In New Orleans' Schools In the city's public schools, test scores are climbing, charter schools are opening all the time, and facilities are being upgraded. But the population of the schools is overwhelmingly African-American. The head of one charter school network says it takes a long time to break old patterns. 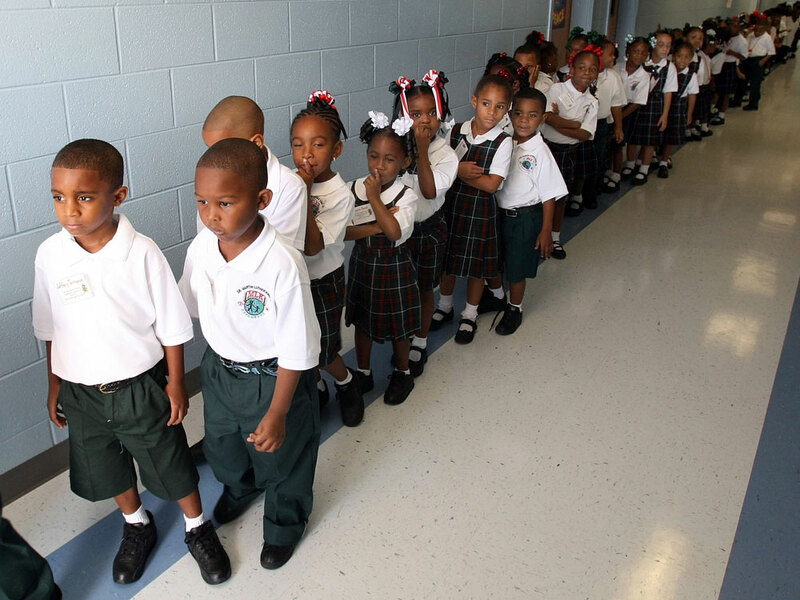 Kindergartners line up on their first day of school at Dr. Martin Luther King Jr. Charter School for Science and Technology in the Lower 9th Ward three years ago. While school leaders say they want diverse schools to reflect the city's population, most schools are still largely African-American. 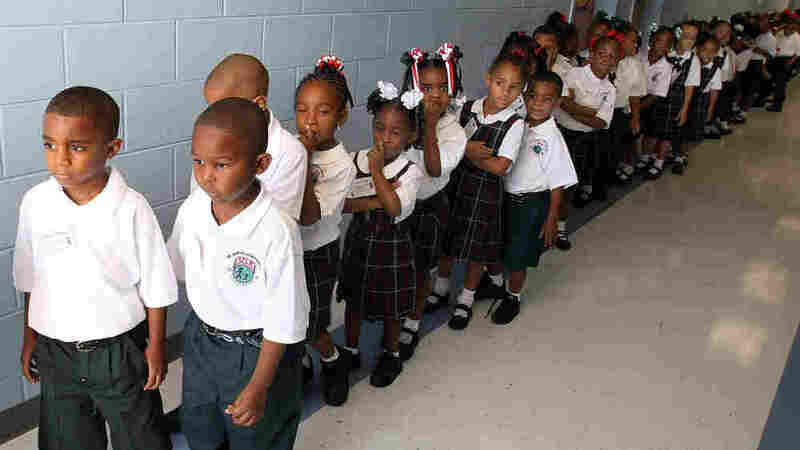 The New Orleans school system has been almost completely remade since Hurricane Katrina hit five years ago: Test scores are climbing, new charter schools are opening all the time, and facilities are being upgraded. But one thing has changed little -- the population of the city's public schools is overwhelmingly African-American. Some parents think that has to change. For decades, white and black families ran away from the city's schools, because they were terrible. Caroline Roemer Shirley, head of the Louisiana Association of Public Charter Schools, says that bred a strong tradition of sending kids to private schools. "And you have parents that were working multiple jobs to make sure that their children did not have to go to a school that was not only not academically excellent, it was not a safe place to be," she says. "It was not a good facility." Today, parents have more choices. They can send their kids to Arthur Ashe Charter School, for example. On first glance, you notice the place is organized. Kids wear blue-and-khaki uniforms. And you also notice that nearly every child in the room is black. Jay Altman, head of FirstLine Network, which runs this and three other charters, says the school is easily 95 percent African-American, just like most other schools in the city. Why do hardly any white kids attend this and countless other schools in New Orleans, a city that is about 40 percent white? Even though test scores are improving, Altman says it takes a long time to break old patterns. "There are a lot of parents who are waiting until there is a greater mass of students who are from the same background as their own students," he says. It is hard to be the first white kid in a school, or for that matter, Altman says, to be the first black kid. There are many reasons to question whether schools will ever become more diverse here and in other urban districts. For one thing, some of the city's most successful schools are completely focused on educating low-achieving, inner city kids. The conventional wisdom here is that these students need a lot of structure to catch up. At Arthur Ashe Charter, it's the beginning of the school year. That means kids have to learn the routines: how to move through the halls, how to raise their hands, why they must keep quiet. In one classroom, a teacher goes over the rules with students -- "We want to be silent because?" -- and she searches for a student who will answer the question. Quickly, one chimes in: "We want to be silent because we do not want to disturb other classmates." Norms of behavior are proclaimed on signs that decorate the entire school building. 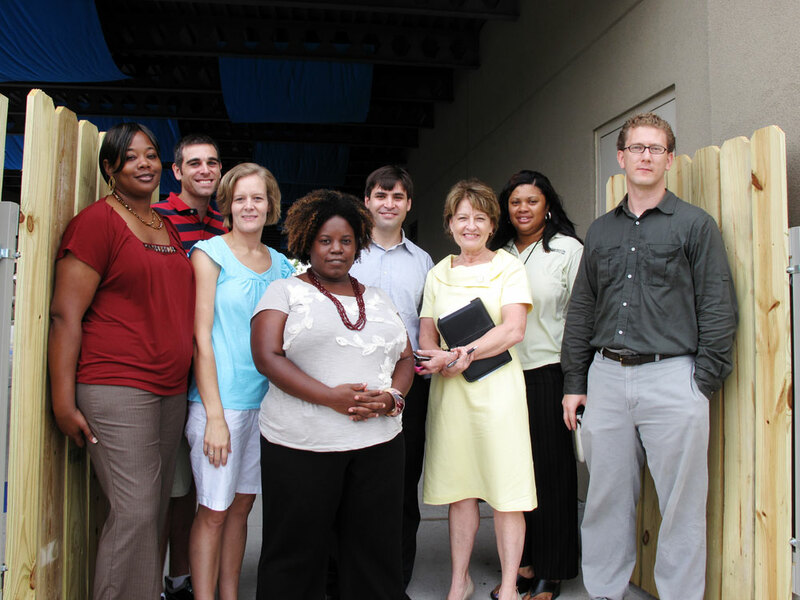 Patricia Perkins (third from right), principal of Morris Jeff Community Schools in New Orleans, stands with parents at the front gate on the first day of school. This new charter school is pursuing something that is hard to find in city schools: a diverse student population. Melanie Boulet, a veteran teacher now in her second year at Ashe, says, "We need maximum learning readiness on the part of the kids. These particular learning habits or behaviors have been researched, and they lead to maximum learning. And they're very necessary in an environment like we're in." Many educators point to the energy and care shown at schools like Arthur Ashe as the triumph of post-Katrina schools. Underachieving kids are simply not allowed to languish as they did before. But will upwardly mobile parents ever be comfortable sending their children to schools that are this focused on low-achieving kids? Some parents feel they can't wait for better test scores to lure a broader mix of students. School has just opened at Morris Jeff Community School, where diversity ranks right up there with test scores as a central goal. This brand new charter school was started by neighbors like the school's board president, Broderick Bagert. He says he was so confident, the school "printed big brochures that said, 'We're a school as diverse as the city we call home,' before we knew what our enrollment was. And it turns out we almost exactly reflect the diversity of the city." Bagert says that just by knocking on doors in the school's Mid-City neighborhood, he managed to attract a student body that is 40 percent white and 60 percent black, just like the city overall. Among them is the daughter of Florestina Payton Stewart, a black parent who wants her child to have a different experience than she had growing up. "For me, I went to private African-American schools my whole life. When it came to graduate and post-graduate work, I attended Tulane University, and it was a big culture shock for me to adjust to new surroundings, new people," Stewart says. "I don't want my daughter to have to experience that." Bagert says that when he proposed starting a diverse school here, he was told by others that he was naive. But he thinks it's naive to assume that rising achievement in the city's schools will overcome decades of racism and segregation. Many school leaders say they, too, want a diverse student body. But they're convinced that once achievement levels rise, white students will follow. That logic rules the day for now. There are no legal requirements that schools integrate, but schools are required to improve.